I mentioned Scrivener in a recent post. It would appear that this word-processing and file management desktop programme – specifically developed by Literature and Latte for writers – is becoming increasingly adopted by academics. There are other, more comprehensive accounts of using Scrivener on the web, such as here. But as a relatively new Scrivener user, here are some thoughts on my ongoing experience of using it in drafting my thesis. Using Scrivener effectively requires a shift in thinking from traditional word processing programmes and practices. I tend to find the best way to learn new software is to dive straight in with a ‘real-life’ project. I found undertaking a 5,000-words conference paper ideal to familiarise myself with key Scrivener features and to start developing my own quirks. I’ve continued to use it for similar small-scale writing projects. Subsequently, in transferring my working thesis texts to Scrivener, I considered creating a separate project file for each individual chapter, and there are probably clever ways of linking / coordinating across projects that I have yet to explore. But I’ve found it more effective to develop the whole thesis within one project file, despite its obvious size. This enables easy transference or cross-referencing of texts across chapters and sections when required. Usefully, expandable / collapsible folders in the Binder (Scrivener’s side menu) allows quick viewing and access to all texts. For me, the best way to go about using Scrivener is to think of texts in the form of ‘chunks.’ I think the most powerful feature of Scrivener is how it supports granularity in the writing process. It allows you to create, organise, aggregate and separate multiple texts of any size quickly and effectively within larger composite files and folders. The ability to change a file into a folder (and vice versa) is one of those features you don’t really ‘get’ at first. But after a while, I found it an instinctive process as texts are collated, merged and expanded as described above. For example, it may be useful to keep several text files in a folder during the editing process. Once you are happy with the arrangement of the collective texts, the folder can be changed into a single, more easily manageable file. I have to admit I’m a bit of a control freak when it comes to formatting. On the one hand, I love the minimalist look and feel of an unformatted writing environment – I often use Notepad or TextEdit for quick writing tasks. Then, on the other hand, when I require formatting, I want to be able to set up and apply my own style preferences easily and efficiently. Scrivener appears to satisfy both these needs fairly well. In the main document view, all the files within a folder can be viewed sequentially, as a composite text. I’ve therefore found it useful to insert the title (appropriately formatted in the style I want) at the top of each folder / file to distinguish them. I also use the split screen feature quite often now. It enables two texts files to be viewed alongside each other (vertically or horizontally). This is particularly useful for cross-referencing texts, or when transferring bits of text from one to the other. 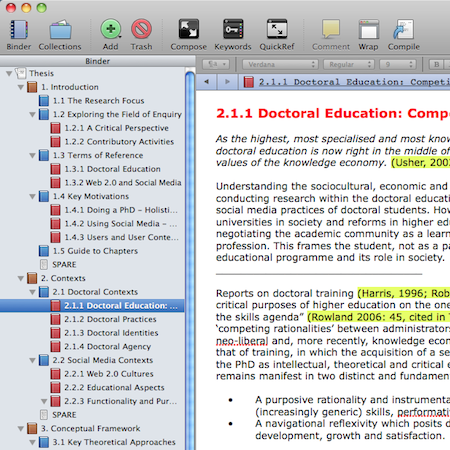 The in-built full-screen option (Compose) provides an uncluttered view of the document view. Though it’s not something I’ve really used much, I can see how some will be attracted to this Zen-like writing environment. I’m still a bit ‘old skool’ when it comes to annotating texts – colour coding and highlighting texts directly to indicate different notations of work-in-progress – but Scrivener supports a number of note taking and tagging features that I may adopt in the future. I’ve also yet to use the ‘Corkboard’ view for indexing specific files and folders. The Scrivener set-up encourages the inclusion of ‘supplementary’ material, such as other imported texts, PDFs and images etc. within project files (it has a default Binder folder called ‘Research’). I’ve found this a useful approach when writing papers, but I’ve decided to keep all support material separate for my thesis to keep it reasonably lightweight. It is of course quite possible to write a thesis without Scrivener (as many do), and some of the ‘best practices’ I have discussed here can also be undertaken (to an extent) using more traditional word-processing platforms. Scrivener is not free but is relatively inexpensive, and, as a free trial version is available, I’d recommend at least taking a look. Though it was initially developed for a Mac (which I am using), a PC version is now also available. There’s much more to Scrivener than the basics I’ve outlined here, and I may be blogging further thoughts once I become more familiar with it. I know of other users (particularly in #phdchat land) who could probably provide greater insight into its more advanced features and how they have adopted Scrivener in their own writing practices. The Scrivener website also provides a comprehensive set of tutorials. For me, writing papers and thesis chapters has become routinized in the interchange between screen and print. The digital environment is great for building and developing structures – I’ve found Scrivener particularly useful for this. But I often find reading printouts and correcting with a pen a more effective process for assessing and refining overall narratives, as well as spotting grammatical errors. One doesn’t necessarily follow the other: it’s rather a reciprocal process between the two media. Here’s a useful tip for anyone with Adobe Acrobat. In his entertaining article from 2007 (revived via a tweet from my colleague @leroyh), Jonathan Wolff describes the tension a novelist creates between story and plot to keep the reader engaged in the unfolding narrative. He suggests however, that the inherent protocols of academic writing – and requirement to signpost theoretical, methodological and analytical processes – dictate such tensions are removed entirely. 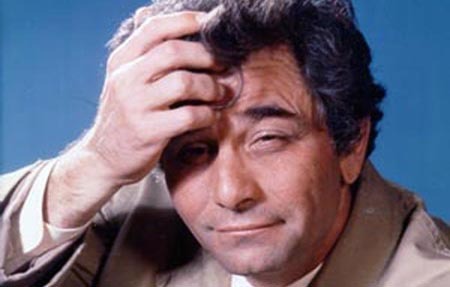 Extending Wolff’s detective novel metaphor to the TV screen; it could be said that academics take the Columbo approach to revealing the ‘killer facts.’ The 70’s cop show from NBC (revived in 1989 by ABC) was unusual in discarding the ‘whodunnit’ format in favour of revealing the murderer at the very start, only for him or her to be hounded relentlessly by Lieutenant Columbo (Peter Falk), whose dishevelled looks and wandering style of enquiry belied a incisive analytical mind, a meticulous approach, and a ruthless pursuit of the truth. This post presents a preliminary draft for a paper I am co-authoring with LeRoy Hill and Tracy Sisson. As some of you will know from previous posts, early this year LeRoy and I designed and presented a series of social media sessions for PhD students and Early Career Researchers at the Jubilee Graduate Centre with the cooperation and support of Tracy, the centre manager. In June, we presented this as a case study of a student-led training initiative, at the Future Learningscapes e-learning conference at the University of Greenwich, and we are accepting their offer to write up the presentation for their post-conference publication next year. They are keen we incorporate reflections on our experiences from presenting at the conference and feedback from attendees. We also decided it would be appropriate to partly conduct the co-authorship process in the participatory arena of the social web. Therefore both LeRoy and I are presenting our personal perspectives through our own sites. You can read my draft on my wiki and download it here. I would be happy to receive feedback on this from conference attendees or students who came to the original sessions, though comments and suggestions from anyone else would be greatly appreciated. Having negotiated some of the most complex graphics, multimedia and programming software known to mankind, nothing quite gives me a headache like Microsoft Word. Since I only recently learnt to use styles, I have become obsessively protective of my revised template and annoyed with anything that corrupts it. Sick of copying and pasting unwanted formatted text between documents and from the Web, a quick Google search reveals I am not alone. Numerous blogposts and forums show consensus in thinking that Word should, by default, paste text unformatted (instead of having to go through several unnecessary clicks to get to ‘paste special’ > ‘as unformatted text’). There’s no easy option to change this; instead you have to delve into the exciting world of Visual Basic. Here’s a step-by-step guide from Paul Spoerry. Really, life’s too short.